Teresa and I will be married for 26 years in June. We had made plans to go to Hawaii for our 25th, but due to the loss of her dad, we sadly had to postpone our quarter century celebration. It was worth the wait. Our plane landed in England and as a foreshadowing for the rest of the trip, was 5 hours late. We sprinted to our connecting flight to Barcelona, only to discover that the connector was also late. We boarded and were on our way! We landed in Barcelona and took a taxi to our friends apartment where we had great conversations with two of their sons. They showed us the best places to shop, eat, and buy famous Spanish pastries. They also showed us the “Metro”, Barcelona’s extensive underground rail system. This was the start of our adventure! Teresa and I freshened up, and took on the Metro as our first outing. Obviously, we didn’t quite get it right. We popped up and found ourselves in a busy intersection of town where every corner boasted of the best tapas, wines, and cafes. I could tell that I was going to like Barcelona. The architecture made me wonder if France stole it from Spain or Spain stole it from France! Ancient Roman aqueducts stood in the Gothic Quarter as a reminder of that great empires influence. The gates and towers of the city’s entrance still stand as well, and we could almost see the generations of old selling their wares and bustling through the city. I touched as many stones as I could. I could imagine the men that built them, and the time it took to carve, assemble, and place each stone in it’s place. Something moves me about time, history, and knowing where we come from. St George the Dragon Slayer is the patron saint of Barcelona. I was intrigued of history and you can find many architectural manifestations of the people celebrating him throughout the city. The Cathedral of Barcelona reminds me of the incredible pains our ancestors took to honor God with the works of their hands. The attention to detail, and the beauty of which builders took time in crafting their architecture is second to none. Grand courtyards and marketplaces drew large crowds of people to share in the wealth and culture of the city, (everything from old Spanish coins to Rolling Stones albums) were offered as we perused the open air tents of the vendors. One day, while we were roaming around the Gothic Quarter, we thought the choir was singing in the cathedral with a professional soprano at the lead. It happened to be an operatic street singer that was moving people to tears with her voice. It was incredible. This happened every day. We would be surprised by every corner, every street, and every person. I met a guy in an old Jewish pub there who said, “Barcelona cannot be experienced with the mind.” He was right. Barcelona get’s into your spirit and soul. It connects our past and present, and forces us to slow down and look around. When you realize there are streets and walls and facades that are older than our nation, it puts things into perspective for us. We were fortunate in that every evening we were treated to another section of Barcelona by our friends that lived there. Tom and Emily Davis were our tour guides and let us in on the best kept secrets of the city. One of my favorite memories is of Tom and I shaking fresh oranges off of trees that lined one of the city streets. Although they were unfit to eat, they were a lot of fun to harvest. Every evening was an adventure in finding the secrets of the city and enjoying the friends to share it with. We visited the Picasso Museum, La Sagrada Familia, and found as many cafes and little off the wall pubs and restaurants as we could. We walked along the Mediterranean Sea and had the best seafood of my life. One night, we ran into a perpetual celebration of second Easter. This included a myriad of bands and singers and dancers that went on into the night and never seemed to end. There were grandpas and grandmas dancing and singing with generations apart. This showed me the true nature of Barcelona’s family culture. Every night was alive with people and family’s bridging the gap of generations. I could tell they were telling stories of ancestors and honoring the past as well as celebrating the present. We saw billion dollar yachts along with simple fishing vessels, all seemingly living along side of each other in beautiful harmony. It didn’t seem people were jealous of what another had. I had a sense that people were content with their lives and culture, and were not ashamed to share it with whomever passed by. We walked the Rambla, a large tree-lined pathway that celebrates Barcelona’s architecture and open markets. There were places that were selling lobsters so fresh, they were still crawling on ice! Teresa and I kept imagining what it would be like to live along such a lively part of the city. The architecture kept coming up in conversation as we continued our discussion of how timeless and beautiful it was. It is hard to walk fast in Barcelona. Everything is designed for you to enjoy the moment, of course, our American way was always showing it’s culture of fast and now. When you are in Spain, you learn to go slow, eat slow, sip, slow, and enjoy all the city has to offer. One of our most special places that we visited was the La Sagrada Famila. I had heard so much of this architectural marvel that I had no idea how I would respond when I was finally able to see it with my own eyes. It is impossible to express the beauty and revolutionary design of this Basilica’s architecture. It was another thing to realize that this has been in process for over 100 years. I tried to put in perspective that one man’s vision has carried on for generations. He realized he would only see one facade completed, but like so many wise men before him, he would “Plant trees under who’s shade he would not rest”. It reminds me of real discipleship. People who get this understand that even the Sagrada’s designer has disciples. 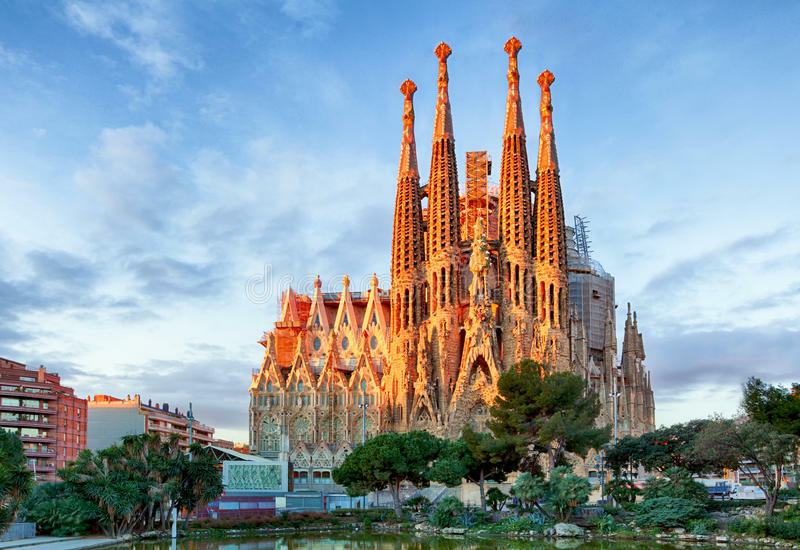 Gaudi’s design was impossible to complete in his lifetime. Our’s should be too. Dear Barcelona, You captured our hearts. Your people, your culture, your life, your passion, and your beauty has forever been engraved in us. You’ve made a deep impression upon us, and we cannot wait to return to your streets, your cafes and hidden gems that are tucked into the most discreet places. Your history and future excite us. I know that you are not without your own problems, but we will return soon to kiss your face and embrace your people! Last night I asked Teresa what she thought about Barcelona. She said…”We needed more time!” I couldn’t agree more. Next Blog…Mijas and Malaga. Our adventure in Southern Spain. This entry was posted in Uncategorized and tagged Barcelona, Cafes, discipleship, family, friends, Gaudi, Mediterranean, Rambla, Sagrada Familia, Spain. Bookmark the permalink. Love it. What an incredible journey. So glad you guys got to have that experience!